14 Speaks: Love and Candy Hear..
As if making friends in our early days was not hard enough, imagine making them at age 85, when you know your time is coming soon and that all your friends have died. 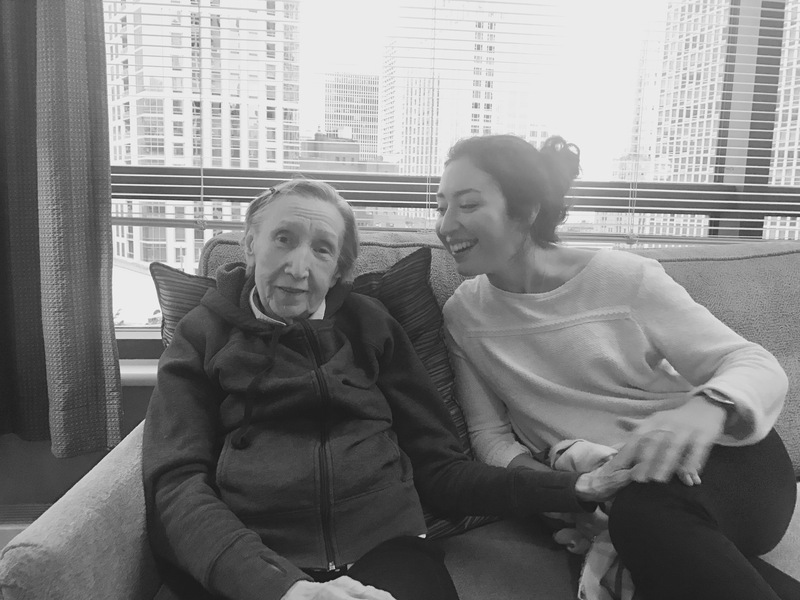 This was the case for Valerie, a resident at the downtown Chicago retirement home The Clare. A smile every day, Valerie said, was enough for her. A wave, a smile and that was it. Sometimes it’s the smallest things that are the most appreciated, and that was definitely the case for Valerie and some of other residents at The Clare. I have always had a soft spot for elderly people, probably stemming from my love for my grandparents. 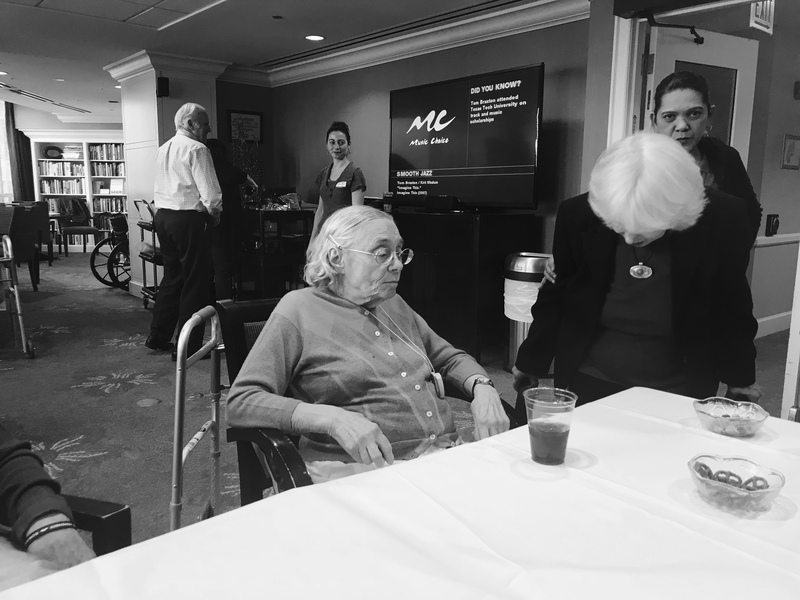 I wanted to do a reporting project on the sad — and yet very real — question about whether or not people in nursing homes still try to make friends. Can elderly people really go through the process of making friends all over again? Do they have the strength? Or is it a different kind of friendship, one less reliant on time and effort, but more on reliability and kindness? Then how do we, as younger millennials, understand their take on friendship and relationships? How can we help them and what do they want from us? After a few phone calls, I found The Clare. I was invited to spend some time with residents during their happy hour one week at 4 p.m. I ended up attending it five weeks in a row. Being able to interact with many sweet and quaint older people was personally rewarding and I looked forward to it every week. Aging is unwished for. Elderly people, especially the ones that are placed in retirement homes, need to admit to themselves that this is probably going to be their last home, and that it’s a step that is justified by their age, but that doesn’t mean they can’t contribute anymore. That’s why it’s important to learn about the friendships they have made within the home, how they cultivate them, and what family and friends mean to them. Studies have found that 35 percent or more of senior citizens are lonely. Roughly one in 10 Americans lives alone — a total of 34 million people, according to 2014 census figures. That’s an increase of 87 percent since 1980. It is also a quarter of the households in the country. There are several reasons elderly people can isolate themselves from the outside world. Isolation leads to loneliness, and loneliness to isolation. Generally, loneliness is defined as a feeling of lack, deprivation or sadness. With the aging of our population, more and more elderly are lonely. Isolation is felt more intensely during the holidays such as Christmas, Valentine’s Day and, Easter. Loneliness should not be taken lightly, since it has serious consequences: loss of autonomy, food disorders, increased stress and anxiety, depression, sleep disturbances, and increased risk of chronic diseases, especially heart or vascular disease. The first time I visited The Clare, I wasn’t sure who was going to talk to me during the happy hour. I looked around at all the residents and found someone who looked particularly happy to see someone new in the room. It happened to be Valerie. We talked for hours on a grey couch overlooking the skyline. As she talked about her past life in Indiana, Valerie held my thigh. She held it for about 45 minutes, gripping harder whenever she was telling me about her life when she was younger. I could feel the happiness, the pain and the hardships she had been through just by looking at her hands. You could see they were old, yet so full of life. She wore no wedding band anymore. She preferred to keep it in a safe, which she occasionally checks on. She wore it when her husband was still alive. She did not see the need to wear it anymore. “It’s freeing,” she says. Valerie was happy about her life at the retirement home. She has a close friend, Tara, a 30-something year old, who was once her caregiver. 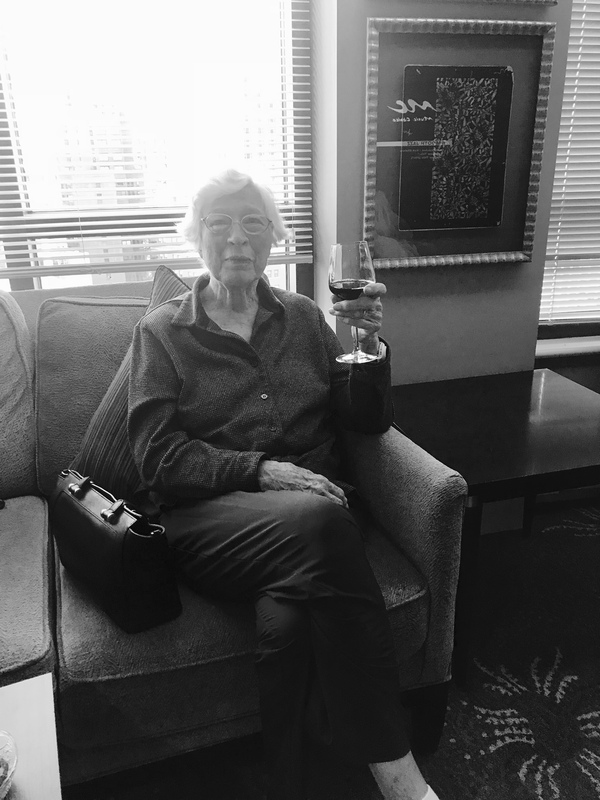 She loved just sitting on the couch during every Thursday’s happy hour and chit-chatting with people. This happy hour takes place on the 14th floor of The Clare. The room was large and elongated, with pale yellow walls and old jazz playing from a TV in the center. Frank Sinatra was singing on TV when I came in. To the right was a library with numerous large-print books, magazines, CDs, even cassettes. Residents come from their small apartments to sit on couches, often not talking to each other at first, as they wait for their drinks. The view is beautiful. Right on Rush Street, they see high-rises, trees and even the lake not far away. The Hancock was overviewing the Magnificent Mile. “I come for of the peanuts, the pretzels and the wine,” said Joan Downing, a resident. Valerie was not very effusive in describing the people she spends her time with. She knew those in the room, but she did not call them her friends. “Friends are sacred,” she said. If she doesn’t know them personally, she calls them acquaintances. Not friends. Nikki Gamble was always there, present for every moment these residents had left to enjoy. She’s The Clare’s life enrichment manager, someone who creates and imagines attractive activities for the residents of the elderly home. “There is always that circle of life where, when you age, you lose close friends, but I don’t see anything like that being a reason not to make new friendships,” Gamble said. Valerie told me she was happy, only because deep down, subconsciously or not, she hoped to live in her Indiana house again, one day. She did not have many memories from her past, only the “happy things,” she said. She did remember one of her biggest regrets, though, and that was to have let go of the one she loved. “I should have told him I loved him, and I should have stayed” Valerie said, looking into the distance. But Valerie was OK. She liked the people at the home. She said they make it easy for her to talk. 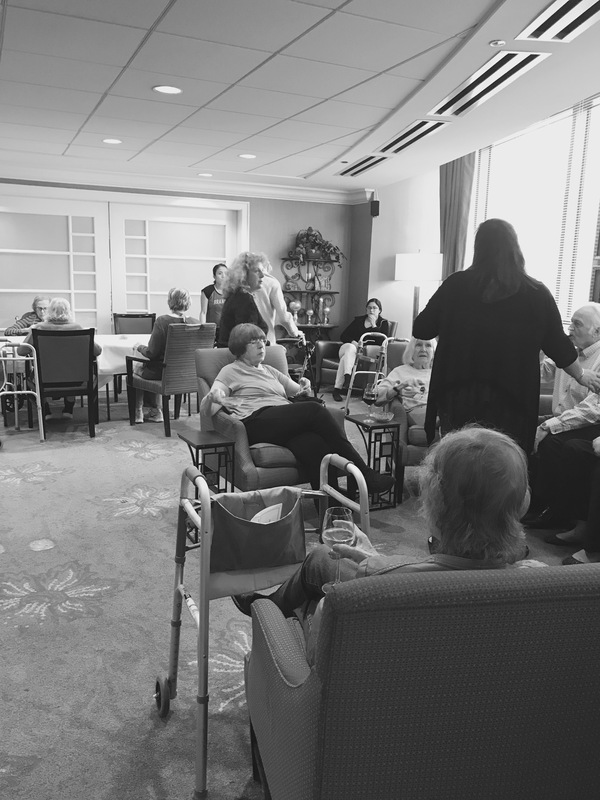 “Being social is such a huge part of senior living being healthy, and healthy aging, because if you close yourself and lock yourself in a home or in a room, you are going to decline much quicker than if you are social and making friends and trying to have new experiences. That’s really what we are trying to promote,” Gamble said. Richard Whorton, the social butterfly of the happy hour, said to me he had many friends at the retirement home. He seemed happy. As he was talking to everybody there, he navigated through the room with his automatic wheelchair. He had a wool grey Christmas sweater on that seemed so cozy. He came in front of me, told me he had many friends and that he was happy, smiled so hard and then left to talk to others. You can’t help but smile when you look at him, too. I did not necessarily leave with an answer to my question — “Are elderly people in retirement homes lonely or do they make new friends?” — but it is important to think about these unconventional friendships and the role they play in the lives of these residents. Nikki has seen what happens when someone living at the Clare loses a friend. Her voice sounded emotional yet strong and caring.